This is about turning parts of a video game into adventure material. In case you were wondering, a spitting frog inspired our journey to the Tikoids (or Tikis for short). If you follow me on Instagram, you probably know that I like to make things, sometimes for the sake of making. I get inspired by something I see in a game or a movie, and I want to make it. But this one time, I decided to base an adventure in our D&D campaign on what I made. Read on for more about the builds, but more importantly the adventures they inspired. Let me start at the beginning. The game in question is called “Zuma’s Revenge” by PopCap Games. It tells the epic story of a taciturn frog who fights a number of monstrous island chiefs in a Caribbean setting. He does that by spitting coloured balls at the lines of similar balls that these chiefs roll along predetermined tracks to defeat him. How that works? I have no idea. Although I have wondered about where all the balls come from. The frog is certainly not changing in size, no matter how many balls he spits out. Somehow, like the Terminator, he can fire multiple times his weight in ammunition. But I digress. The game appears to be “out of production”, probably on account of being old. You can download it for free here – not an affiliate link, what with it being free and all. Also, download things from the internet at your own risk.In addition, I do not make any claims regarding their IP, and I am putting what I came up with out there to inspire you. That being said, play the game, it is a fun distraction from the things you should actually be doing. Like I said, this game features what amounts to boss monsters along the way. 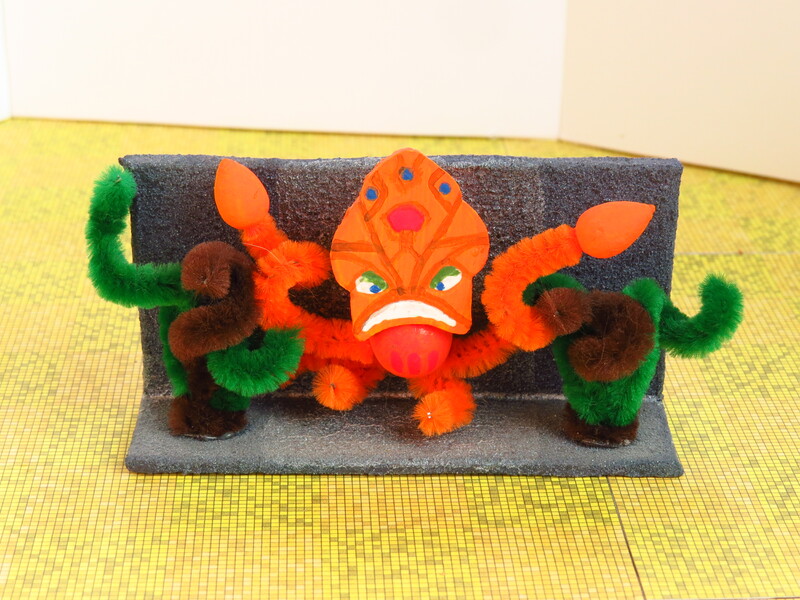 So I created small dioramas depicting these bosses pretty closely to what they look like in the game. The fact that the game graphics are pretty much 2d helps, too. When I finished them I placed them on a shelf next to items related to our D&D campaign. They included miniatures of memorable pain-in-the-butts, including at least one arch-nemesis. So a thought occurred to me. Maybe I could justify making these pieces by using them as minis in a game? Yes, I admit it. I did not think “Hey, they would work well as minis”. No, I wanted to justify the time and effort involved by pretending that using them for our group’s benefit had been my intention all along. Also, at this point I started to refer to them as “Tikis”, and I do not really recall why. The islands they haunted became known as the Tikoids. Also referred to as Tikis. I never said this would be easy. 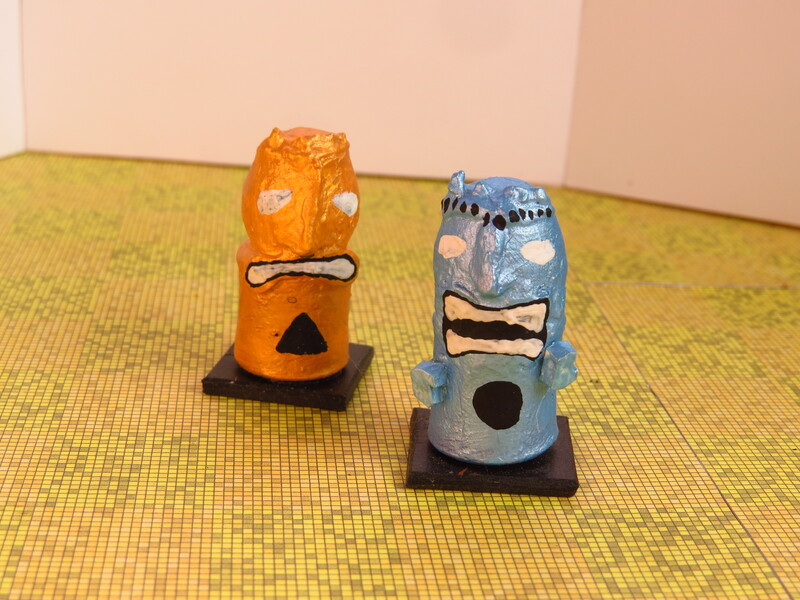 The main material I used for the tikis was plastic. I used what they sell as hobby sheets at a local craft store, and it comes in several different colours. It is about 3 mm (3/32 “) thick and can be worked with a fretsaw and even knives. It can also be painted and glued (with plastic glue). So that is what I did. 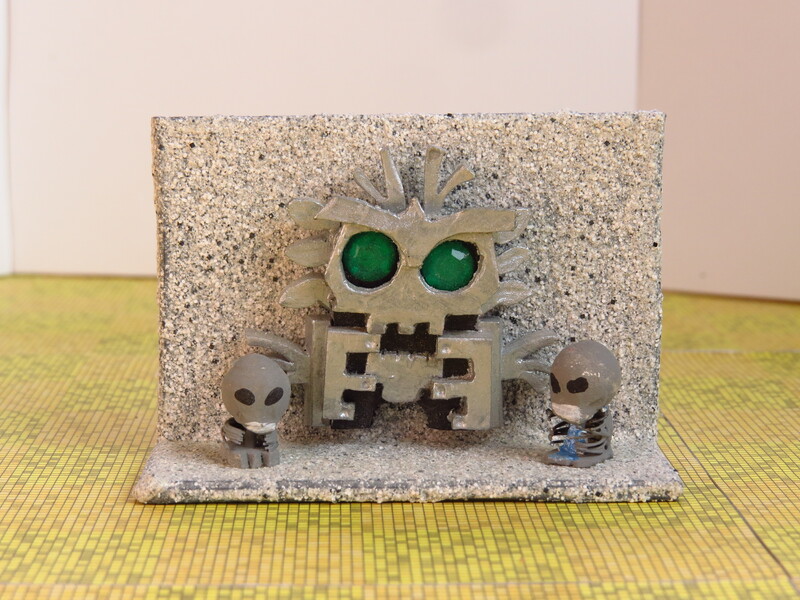 Every mini-diorama starts out with a basic L-shape, followed by the shape of the particular idol of the tikis’ head (which is all there is of them) propped up or attached to the back with several layers of cutoffs as spacers. I will give you more specific details for every single one below. But before, I want to go into how I turned part of a computer game into an adventure of slightly epic proportions. *Yes, the Discworld-reference war purely intentional. You read that right. Let me preface this by saying that I want you to be inspired by what I share with you. Mix, match and adapt this to your needs. Pick what you like and drop what you do not. In our campaign, we used a basic D&D cosmology. The quest giver was an exarch of a god who knew the party, but an archmage or a seer would work just as well. Likewise, you can replace the threat – the cosmos suffering severe wounds through dark rituals – with anything that fits your narrative. So the backstory went like this: the six rulers of a remote group of islands set out to replace the gods. They had apparently been mad for some time., The dark rituals they dabbled in prolonged their lives, much to the dismay of the population. But at some point, they learned of forbidden magic that would not only allow them to become gods themselves. It would let them replace the current pantheon. An Exarch of one of those gods tasked the party with putting an end to this madness. He cited obscure rules that would keep the gods from interfering directly. Worse, he revealed that if the six lords succeeded, their actions would do serious damage to the cosmos. Basically, it would allow other interested parties from outside to exert their influence and tear the world apart. My goal was to create mechanics for these rulers that fit their theme and diversified the encounters. Basically, the party will be island-hopping from chief to chief. You can expand on that with NPCs that relay what happened on the island. Or with the challenges of travel without the ability to teleport. Consider this a framework that you can build upon. Or tear down in parts. The best thing about this adventure is that it works at every level – literally. The threat is epic, pertaining to the cosmos itself. But the key figures can be as low-level as the party needs to survive! It did not occur to me at the time, but this makes so much sense when you want to change things up a bit as far as threat level goes. Let me know what you think in the comments or via info@walkingpapercut.com! Below, I will give you a rundown of the six leaders (also called Tikis at times). You will find an overview of how they worked in the game, what their home looked like, and a little bit about how their particular mini-diorama was made. I also outline how they could be defeated in our campaign. Kathiki grew up on a jungle island where hunting was both a necessity for survival as well as a sport to prove your mettle. As such, it comes as no surprise that he chose to consume living flesh as his way to immortality. His rituals and his diet have left him immobilized in his former seat of power. Now, he has two insect-like servants feed him a steady diet of rodents. They breed them right in his inner sanctum because his hunger outweighs his aspirations as a hunter. Who can tell whether the skulls support him or he wants to keep them down… Maybe he is projecting the world from something even worse? Another Adventure hook? Getting to his temple can be tricky since his aura of perpetual hunger has drawn other predators to the region. While they find that there is no prey left, they do not leave but instead turn on each other. From time to time, one will venture into the temple, only to be eaten by Kathiki himself, thus strengthening him that much further. In his inner sanctum, it becomes apparent that he is not above taking whatever help he can. Sigils and idols of several fertility deities adorn the room. Likely to make sure that there are always enough rabbits, squirrels and cats around for him to consume. His servants, while trying to defend their master, will do their utmost to feed him something at least every other round, either by carrying it to him or by throwing it if they get desperate. The face of this idol was cut from the aforementioned plastic sheets. Eyebrows and jaws were of the original thickness, while the pieces for the mane were sliced to make them thinner. The teeth were cut to shape from small scrap pieces. 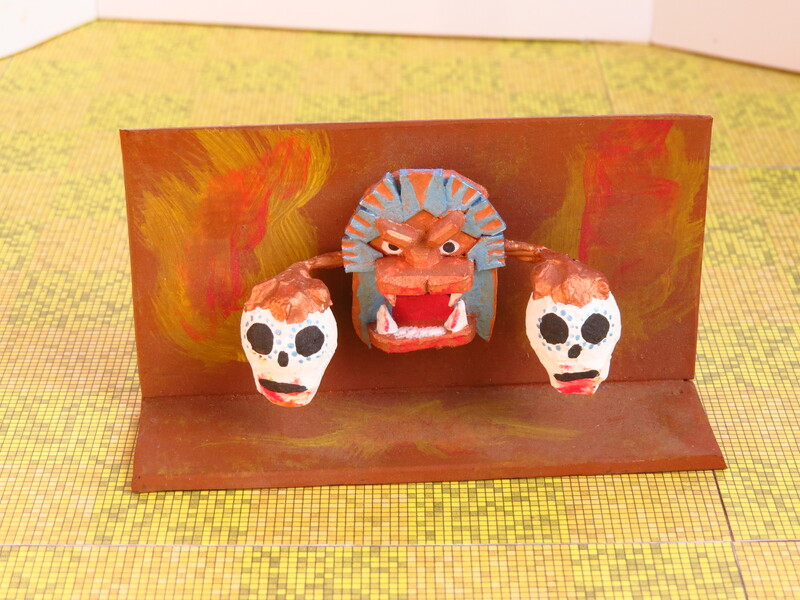 The two skulls were made from paper balls from a craft supply store, with a layer of filling paste from a tube meant for small home repairs. With this air-drying plaster, I also added their jaws. Lastly, a piece of wire serves as arms, connected to the skulls using hot glue which also forms the paws. If he is prevented from eating fresh meat for any length of time, the rituals he underwent will consume him. Soon after his food source runs dry for whatever reason – be it someone releasing all his animals, or his jaw being blocked somehow – he will wither away within minutes, leaving behind nothing but a pile of dust. As far as treasures go, Kathiki never really cared for riches and has not amassed any – except for the fertility idols. They can be sold for a nice sum of money. Or be returned to the cults they have been stolen from for a chance of a more arcane reward. In addition to that, characters can obtain a pair of very fertile rabbits, highly sought after among rabbit breeders in whatever country they hail from. They can also find a richly adorned pedigree for them, which raised their value even further. 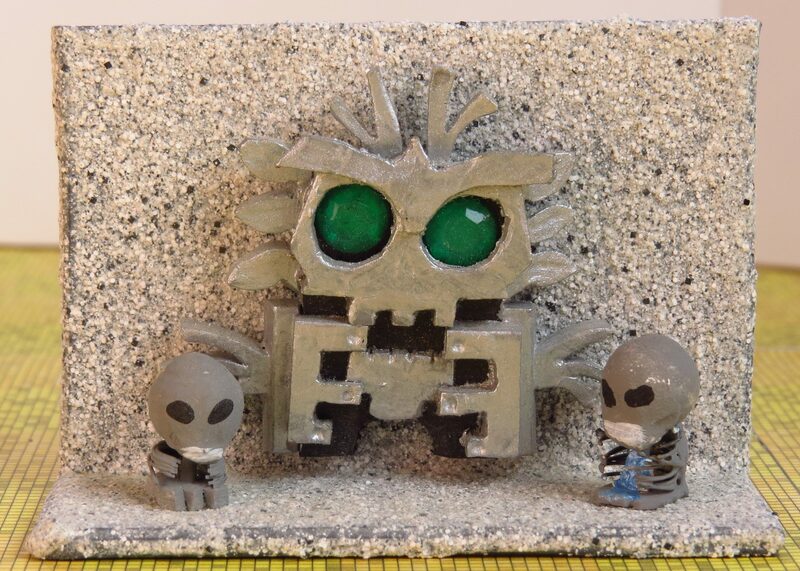 His island is richest in mineral deposits and precious stones among all the Tikis. Digo has been fascinated with the rarest of the rare gems from a very young age. Thus, he chose them as his mode of apotheosis. Ingesting large amounts of ground stone and gem has turned him into an immobile stone face. But still, he keeps breathing in the dust that his servants prepare for him. He resides in a cave cut deep into the massive bedrock of his island, surrounded by massive quarries and dig sites. There, his servants are forced to mine rare gems and the purest of stones. Whatever they find will then be ground to dust and delivered to the idol. So that he can inhale the stuff that he believes will turn his worldly body into stone and thus, immortal. As Baron Digo’s mastery over all things stone increases the number of followers and servants dwindles. Hard physical labour, mining accidents and the fine dust in the air take their toll on the population. Near the end, only a few feverishly loyal guards remain in the quarries. Which is fine, because there is no fight left in those wishing to escape the Baron’s grasp. 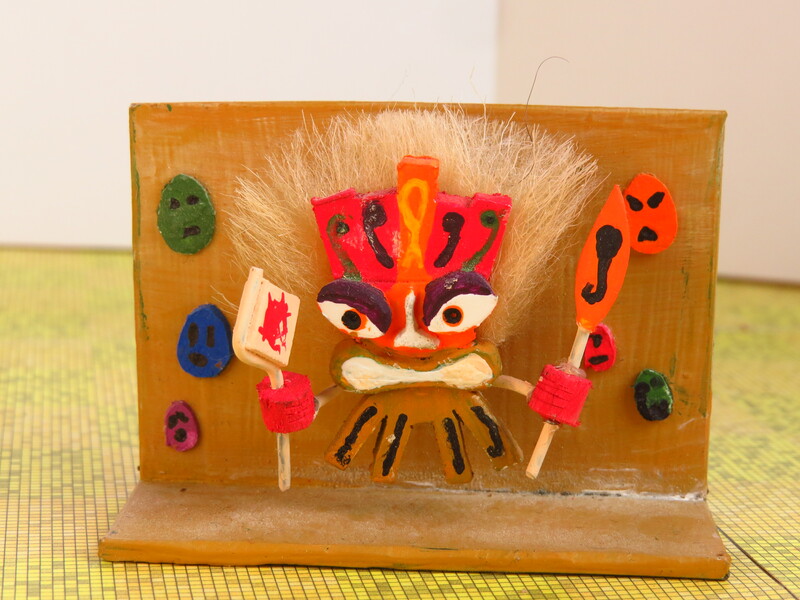 Again, this idol’s face has been cut from plastic, with the mane-like decorations behind it having been sliced thinner. The eyes are fake gems from the craft store. The two tikis in skeleton form, based on a game mechanic, consist of wire parts for the bones, paper balls with filler paste for the skulls, and hot glue to keep them together. The paint used on the display is stone effect paint, which comes in several colours and has particles dispersed in it that will not only add a stone look to a piece but also add some cool texture. You can find that in most craft stores as well. Inside his inner sanctum, the air is laden with ground stone and gems to the extent that all but the most resilient will suffer from dizziness and crippling headaches. Improvising some protective gear (such as wet rags to breathe through) will alleviate those symptoms, but only to an extent. Through the rituals he underwent, Digo has gained some actual control over all things made of stone, or so it would seem. He is able to close the massive stone door that seals his room. Furthermore, he can move several stone pillars and he uses them to crush interlopers. While it may seem that he has gained mastery over stone, what he can actually control are a number of rare crystals. They somehow resonate with him and have been embedded in the doors and the pillars. Once they are crushed, Digo is helpless and cannot influence his surroundings in any meaningful way. Then, adventurers can attempt to defeat him by preventing him from inhaling dust for any length of time. Using water would be a good way to achieve that. In death, he would actually get what he bargained for – what remains of his form turns to pure stone. Given that he ingested most of them, there are precious few valuables to be found in Digo’s room. Everything of value would have been ground to dust and fed to his ambition soon after it had been unearthed. Instead, there are fossils to be found in refuse heaps all over the quarries. They have proven to cause the baron indigestion and were thus discarded. Among them, cunning adventurers can find a few rare specimen. Scholars would likely pay good money for the right ones. Among them, though, there is one that might actually be best left alone – proof of the existence of a common ancestor of high elves and dwarves. Unearth that one at your own risk. Unlike the other idols of the tikis, Maga Maga was not born to rule. He did not fight to become his island’s ruler, either. He hails from a long line of shamans, and it was his dedication to his people that led him to the temptation of unnatural magic. When a mysterious plague swept over his island, he decided that he had to become something greater. Sadly, his humanity was left somewhere on the way. His rattles produce a soothing rhythm – until he hits you over the head with them. Maybe they retain some of his power? Maga Maga’s way to achieve immortality is to consume as many healing potions and tinctures as possible to turn his body immune against any disease. When he could not prepare them fast enough, he taught his servants to brew them for him. Eventually, when he was already immobile in his hut and hiding his bloated face behind a shamanistic mask, they used long bamboo pipes that stretch to other huts surrounding his to feed him. Through the dark rituals that he underwent in order to increase his healing powers, he has gained immunity against most diseases – as long as his body is supplied with a steady flow of potions. While he hopes for the effects to become permanent, he is not quite there yet. Thus, if the potions ever stop coming, his form will succumb to a multitude of diseases within minutes. In addition to the basic plastic face, Maga² sports a fashionable mane cut from a piece of fake fur and hot-glued to the back. The rattles were made of thick wire with plastic headpieces, held in place by arms made of the same wire. 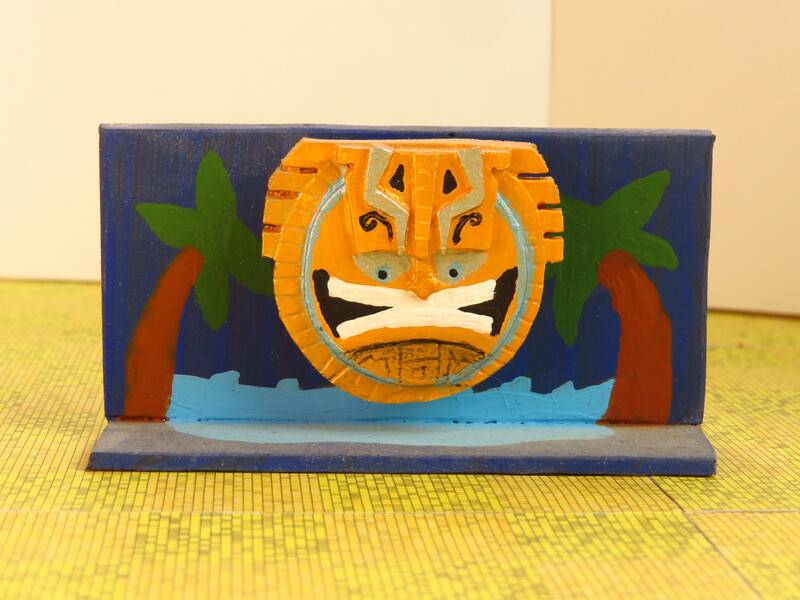 The masks on the back were actually cut from cardboard because it is easier to work with than the plastic and offers a slightly different texture when painted. This is also the only mini that came with its own servants, namely two fellows who take care of their master – see below. They are made from paper balls/rolls and some filler paste to give them the proper features. Surrounding the shaman’s hut, a number of his servants are perpetually busy brewing the potions that sustain their master. What they need is grown all over his domain. Whatever land is not used to harvest food is needed to grow herbs and tend to animals that yield vital ingredients. There are seven huts surrounding the one in which Maga Maga resides, and the fumes emanating from them are at times nauseating despite the smell of healing herbs. They are connected with bamboo pipes through which they keep pumping the finished batches. And they have at least a few barrels in stock to make sure they never run out. These huts are protected by pairs of trained shamans (referred to in our game as the original Tikis) who would create powerful shields using special hand gestures. In addition, Maga Maga’s influence extends to well beyond these huts, and he can use his shaman rattles to cause sickness and disease. The best bet to destroy him is to attack him in his hut, prevent his own Tikis from casting their shield, and attacking the potion pipes. The shield, though, cannot be broken. The only way past it is to prevent the Tikis from completing their gestures, and it will quickly weaken and vanish. Amassing riches has never been an ambition of the shaman, so there are few obvious valuables in his hut. What he was fond of, though, was craftsmanship. With a little haggling, adventurers can sell his handwoven headgear, as well as the beautifully crafted rattles. The later might still contain a spark of dark magic, and fetch an even better price for it in certain circles. His two servant tikis should not be dismissed too easily, either. In order to fulfil their role as protectors and shield-makers, they have been given padded dancing shoes made from the finest materials. These shoes would be valued beyond belief if the adventurers can find the right person to sell them to. Kolo inherited the title of ruler of his island at a young age. Having been fascinated with insects, he ordered his people to worship several insect deities that he himself made up long before he ever considered becoming a god himself. Through a series of edicts, he slowly turned his once fertile home into a cesspool of marshland and swamps. It should not come as a surprise that he prefers insects to humans, and under penalty of death, it is forbidden to kill anything with six legs. Is it really the belief of his followers in his made up gods that fuels his power? Or is it the insects actually believing in him? While he set up his insect pantheon long before he came in contact with the dark rituals that were supposed to grant him godhood, he was quick to use them to fuel his newfound desires. His reasoning was that belief makes gods. But instead of replacing the made-up deities that he had forced upon his followers long ago, he introduced himself as their head god, the one which all the others worshipped. He reasoned the faith of his servants would flow through his insect idols to him that way. He shied away from any human contact and hid himself in the former royal palace. Ccountless swarms of insects protect and even nourish their master there. Dark magic has turned him into a vile, immobile creature sitting in a clay structure inside the palace, built for him by termites and wasps. Inside that dark cavern, there is a single oil lamp that serves the sole purpose that every now and then, a servant can come inside to report and to receive orders from their gods – and refill the lamp. 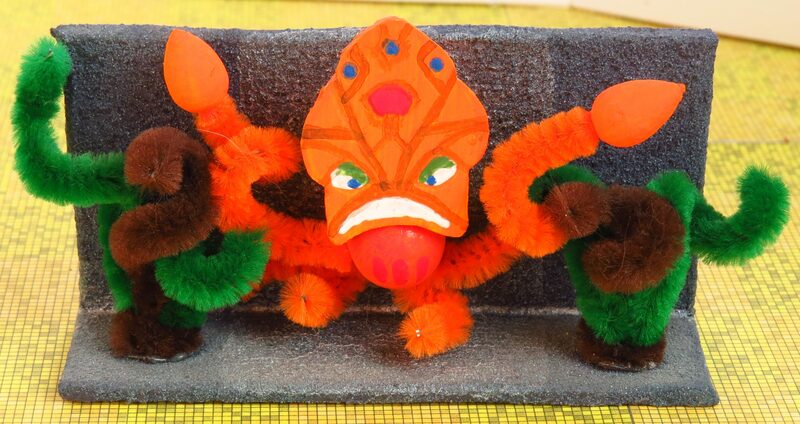 The room itself is teeming with insects that fiercely protect their would-be god. They also feed him occasionally – an act that Kolo considers a noble sacrifice on their part. The basics are the same for this mini, with the face being made from plastic. 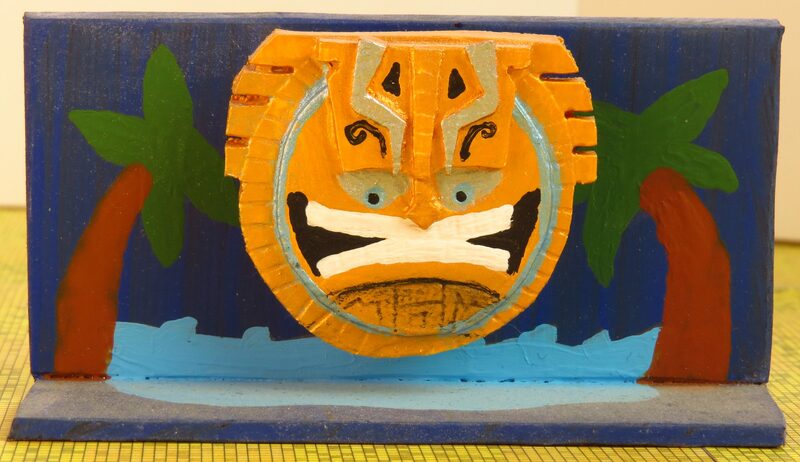 What I did differently here is that I used a screwdriver to add texture to the plastic itself. The ridges surrounding the face as well as the nose have been made that way. While the plastic does bounce back a little, it is possible to create permanent grooves and divets. Unlike other Idols of the Tikis, Kolo does not rely on ingesting anything to sustain his current state. To his mind, it is the belief that fuels and empowers him. And through the dark rituals, his own belief has shaped his reality. He will continue to thrive and be able to control insects near him even when he is somehow prevented from receiving “noble sacrifices” of the insectoid kind. What cunning adventurers can do instead is desecrating them. The easiest way to do that is to smear them with crushed insects, which is blasphemy based on Kolo’s own interpretation. Once spoiled, they cannot pass along the faith energy from his followers, and once all his idols are gone, he will die. For no other reason then that he believes it so. 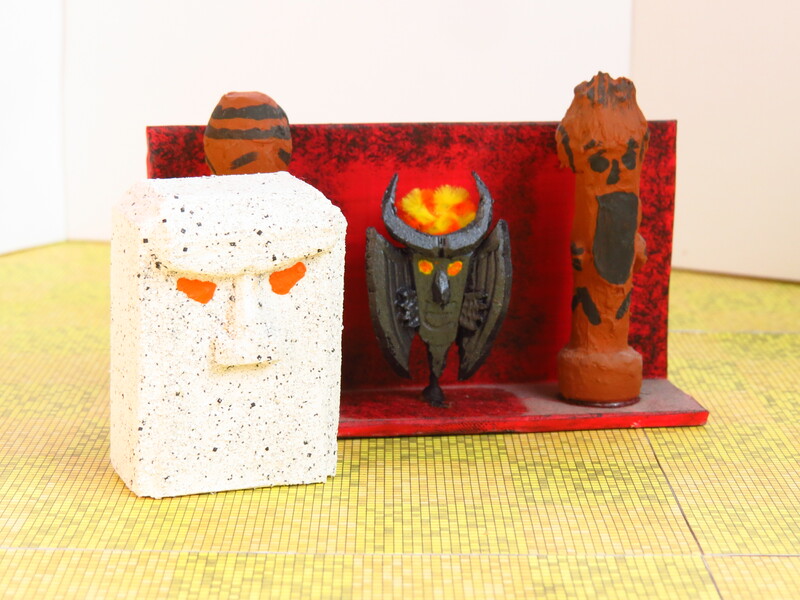 The obvious loot in Kolo Kamari’s lair is the five statues made in the image of his five imaginary insect gods. There is the mantis made of solid gold, the silver ant, the bronze idol of a woodlouse, the ivory carving of a bug, and the gnat made from pure platinum. Depending on the looting adventurers’ inclinations, these pieces might be worth more as a piece of art than the material itself. On his home island, people believed that their rulers should know the lives of their subjects. As such, it was customary that those born to the ruling family would learn the basics of all trades. Cephalo, though, stuck with fishing, and developed a deep affinity for water – to the point where he could feel the tides. Unlike most of his kin, Cephalo has some wriggle room. Did the plants just move in accord with his arms? He spent most of his days swimming and diving. Several times, he almost drowned because he refused to come up to breathe. People grew worried, and his parents tried to keep him locked up to prevent him from hurting himself. They granted him a basin so he could half-submerge himself, but when he refused to breathe even then, they took that away, too. Little did they realize that their son had somehow gained access to dark rituals that had already begun to change him. To punish those who kept him from his destiny, he summoned a freak flood that swept away most of the island’s infrastructure. And a large chunk of his people, his own family included. Now, he resides in a bay, half-submerged most of the time summoning floods and creating vortexes to practice his control over water – and thus approaching his dream of immortality as the god of the seas. The people that remained on his island – living in houses on stilts or in tethered boats – do worship him, mainly because they have no other choice left. This small god was actually made without using plastic for the face. Which is, of course, a shocker. Instead, I used cardboard, glued to a large paper ball cut in half. The pipe cleaner arms were attached with glue into the hole of the bottom, intact paper ball. The tips of the arms were made from paper-pieces that already came that way, but using small balls with filler plaster would work as well. The decorative plants are simply pipe cleaner held in place with hot glue. In his current state, removed from his former humanity, Cephalo resembles a squid more than anything else. 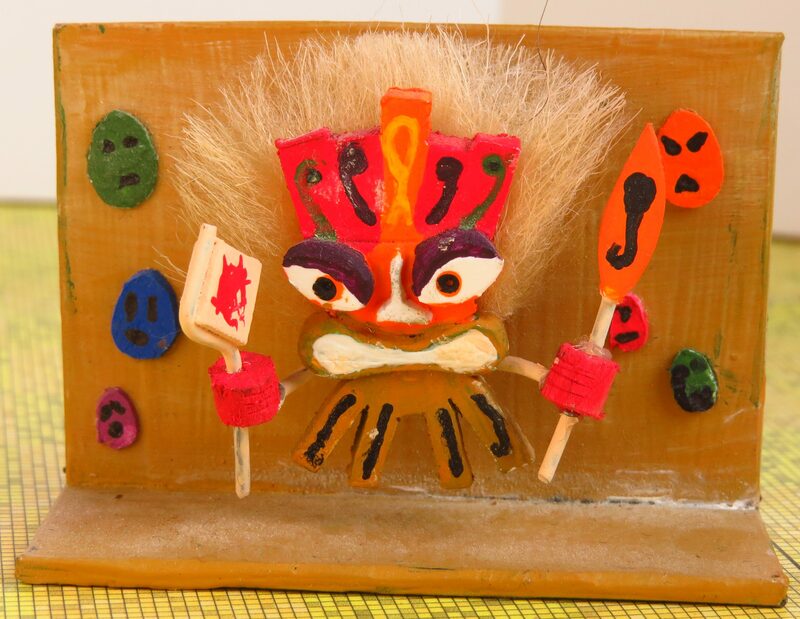 He has retained control over his arms and has the biggest reach of all the Idols of the Tikoids. Thus, he will try to grab anyone who approaches him and try to squash them. To defeat him, he needs to be put on dry land, which is tricky to do given that his antics have worn down the island surrounding him. Near the end of his metamorphosis, he can even create an icy shield to protect himself from harm, which also makes him more resilient to fire. Lightning, on the other hand, is likely to stun him for a little while. There is virtually nothing to be found near Cephalo Ka since he neither cares for nor puts value in any kind of riches. What cunning adventurers can find is that there are deposits of rare minerals and gems to be found all over the island, washed out of the bedrock and left there by the retreating waters. They can be gathered in a very pure state with the necessary care, to the great delight of alchemists and other crafters. What happened next is more of an aside to pay homage to the game. It is also a spoiler, so skip this if you… Well… It is not that much of a spoiler, especially considering that Zuma’s Revenge is not a very story-driven game. Adventurers searching for the last of the small gods encounter a creature, on any of the islands that fit the narrative. 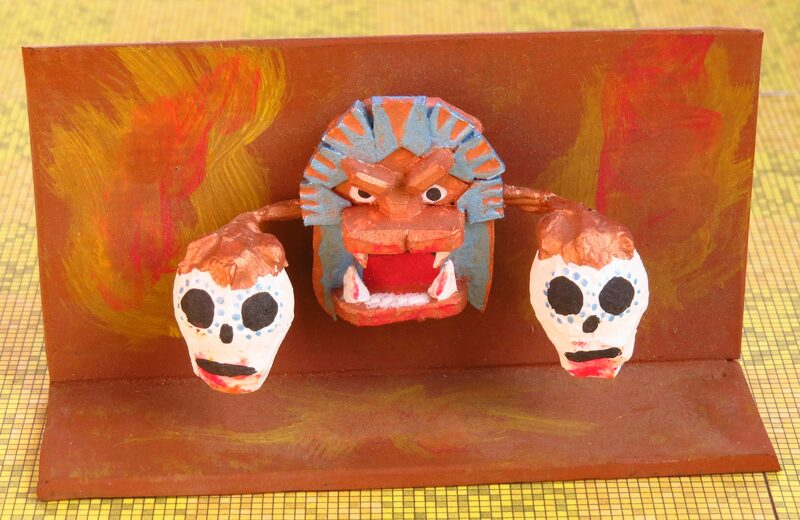 The creature reveals himself as the cook of Zhaka Mu, the rulers of the Tikis. He is distraught and freely confesses to having used a tome of forbidden knowledge to prepare the most astounding meals for his masters. In doing so, he involuntarily opened those already volatile individuals up to some malign influence. Gods know who or what excerts it. And apparently, the Gods do not know. He cannot say where he found that tome, his own mind shattered from what he set in motion. And he already burned it and buried the ashes – but only after it was too late. Also, the cook will not offer much resistance, no matter what the adventurers decide to do. He would not even dare prepare a meal for them for fear of poisoning their minds, too. Nobody knows where Zhaka Mu came from, or even what he looks like. He took over his island, the largest of the Tikoids, sometime before the other rulers succumbed to their insane desires. Rumor has it that his bid for power was a bloody one. His island, though, appears untouched by the madness surrounding it. There are whispers about his cruelty and profaneness, but at first glance, life on his islands is good and his subjects are happy. It is the second glance that reveals that something is amiss here. People keep repeating tasks without any result, and some wander around aimlessly. Just a little further, and the mind pulls back the curtain of illusion and reveals the inferno that is Zhaka Mu’s domain. So this is the being behind all the evil on the Tikoids? Or is there more to it than meets the eye? What looked like villagers turns out to be ghosts and reanimated corpses. Their howling and laments fill the air, as does the smoke of countless fires raging despite an obvious lack of fuel. Houses have burned down to ash long ago, and there is little to no vegetation left. Harsh winds whip over the land and carry sharp debris of the island’s former glory with them. The only building left is the prominent great hall in the centre of the island. Standing on a hill it overlooks the desolation of the island below. Inside this hall, amidst mute skeletons slowly and pointlessly trying to crawl away, sits a large white stone slab with glowing eyes – what is left of the ruler Zhaka Mu. He, the strongest of the small gods, uses the energy of the land itself to fuel his hunger for power. Even after all his subjects had perished, and fires had consumed anything else, he still keeps draining the land, creating a place that is more hellish than some of the actual hells. If his stone shell receives sufficient damage, it will eventually crumble and reveal the even truer face of evil, the actual creature that is Zhaka Mu. The question whether his rituals changed him or he started out as something else entirely will probably never be answered. The TRUE face of Zhaka Mu! Why would he hide inside a hollow stone face? How can he even see? Or can he see more than you think? In his true form, Zhaka Mu likes to go physical and use his claws. Despite having wings that allow him to hover, he cannot move away from his altar too much. It is the focal point of his rituals, and he has not yet consumed enough energy to make the leap to godhood. 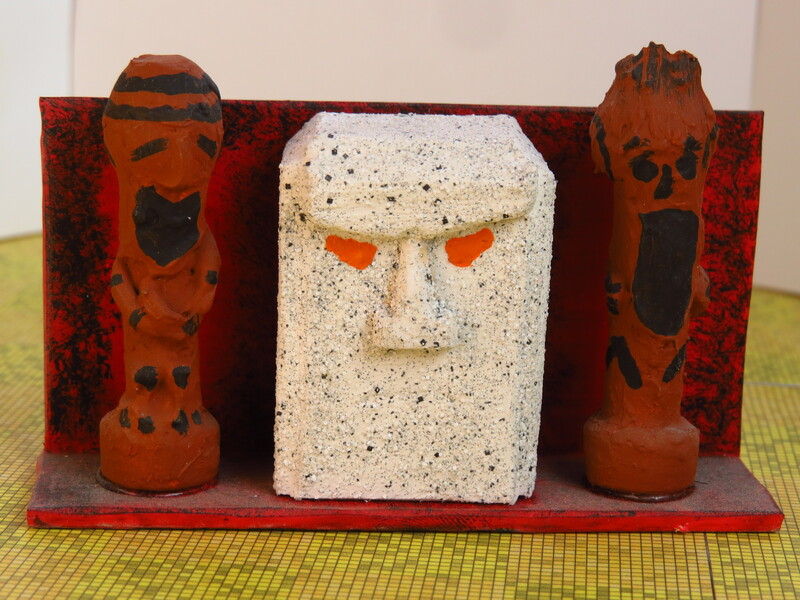 The two totem-tikis standing next to him were made of different sized paper rolls, glued together with hot glue and textured using filling plaster. I guess you could say that there is a pattern to this, and I have to agree. It is a material combo that I have worked with on many projects, including custom paper minis – which I will write about at some point. But I digress. 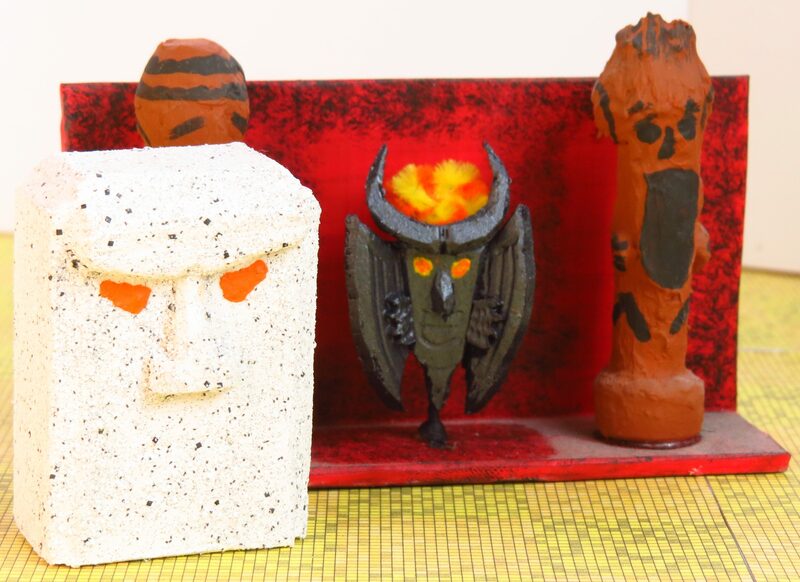 The blocky face of Zhaka Mu consists of plastic pieces glued together, with their upper edges cut to 45° where they meet. Hot glue lends them enough stability for that. The paint is, again, stone effect paint, and I think this one is called “marble”. And finally, Zhaka Mu himself, in whatever truest form he is portrayed here, is made from plastic with heavy use of texture made by scratching into it. There is also a halo-like fire effect made of pipe cleaners attached to his back. Unlike the other chiefs of the tikis who were all attached to the back wall, this one had to be a floor-standing model. Otherwise, the white head would not have fit. And while you could cut out a slot on the back, that would give away its secret too easily. Adventurers feel a constant pull on their life force as soon as they set foot on the island, and things only get more intense as they approach the last remaining god of the Tikis. Once those who have bested his fellow would-be-gods approach, he will thank them for releasing all their energies for him to consume, making him that much stronger. In a fight, he can channel energy into beams of destructive light that scorche anything in their path. He also likes to attack with punches made of pure force to topple his opponents. And make them easier to hit them with his beams. Whenever someone gets damaged by his actions, he draws that much more energy from them (think vampiric health transfer for the sake of game mechanics). Removing him from the focus point of his rituals is the only way to stop his coming apotheosis – which is close at hand for narrative reasons alone. The important point, though, is that he can be defeated. He is not all-powerful yet, and his power still comes at a high price. Perceptive characters might notice links between weather phenomenons and his attacks, and use them to their advantage – somehow. The domain of Zhaka Mu has been cleansed of anything worth anything pretty thoroughly. Most treasures have been utterly destroyed by the raging firestorms. What was left was then consumed by the idol as it sucked up all the energy from the living. And then from anything dead. Which is what makes some of the leftovers actually worth a lot in the right circles. Adventurers versed in the basics of necromancy will find a couple of bones that have retained a special kind of energy. Probably because they fell in spots where there were eddies in the flow of power to Zhala Mu. These bones can be used to create powerful constructs and conduct dangerous rituals. Which means they are probably worth more than all that Zhaka Mu ever consumed. Once Zhaka Mu is dealt with, there is the matter of energy release. This will occur either instantaneously or conveniently after the vicinity has been looted. What happens next largely depends on the adventurers’ standing with the gods who sent them here. They could harness this energy into divine boons for their champions. If, on the other hand, they found their performance to be lacking, they might simply shield them from the destructive wave – a blast that also wipes away all traces of foul play on the Tikis. If the gods are even less pleased, though, they might let the discharge run its course. In that case, adventurers will likely suffer severe damage to themselves and their belongings. On top of that, they will also find themselves cast through the cosmos. Where they end up is anyone’s guess. With any luck, it will be a place not immediately fatal to mortals. 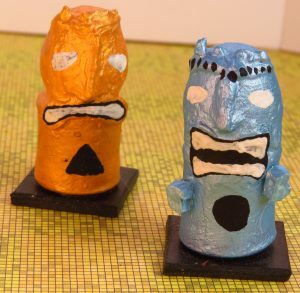 So what really happened on the Tikis? What happened in our campaign is that some outside force planted the seeds for major havoc. God-destruction through as simple a means as a recipe book. Who or what was the source of this forbidden knowledge? In our campaign, the answer is a cult seeking to grant several Far Realms entities access to the cosmos. I think it makes sense for a one-shot, but you shoulld modify that answer to fit your ongoing campaign if necessary. What I love about this adventure is that it scales really well while still being epic in nature. 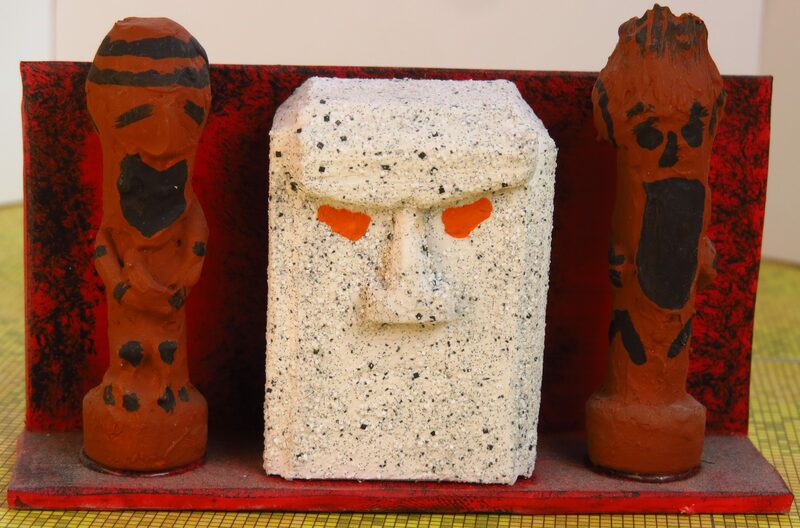 The mechanics of the tiki idols makes them a threat to the cosmos itself – as epic as it gets. But they are still low-level enough for not-yet-epic characters to deal with. Also, they require some ingenuity rather than brute force, which is always nice. Thank you for stopping by and sticking with me till all the way down here. I hope you enjoyed reading about how I turned a piece of a fun video game into a slightly epic adventure. And you can do so, too! Let me know if you have questions, or even better, if you adapt something like this yourself, via info@walkingpapercut.com.